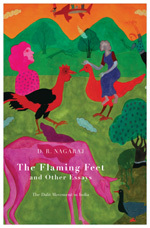 A new edition of The Flaming Feet, a collection of essays on and around B.R. Ambedkar by the late Bangalore University professor D.R. Nagaraj—“the foremost non-Brahmin intellectual to emerge from India’s non-English-speaking world”—has just been published by Permanent Black. Edited and introduced by his former student Prithvi Datta Chandra Shobhi, a Mysorean who is on the faculty of the department of humanities at San Francisco State University, the book has been hailed by the historian Ramachandra Guha as the most important work of non-fiction in 2010. “Babasaheb [Ambedkar] had no option but to reject the Gandhian model. He had realized that this model had successfully transformed Harijans as objects in a ritual of self-purification, with the ritual being performed by those who had larger heroic notions of their individual selves. Is even B.R. Ambedkar safe in Mayawati‘s hands? This entry was posted in Issues and Ideas, Literati, Mysore-Bangalore and tagged B.R. Ambedkar, Churumuri, D.R. Nagaraj, Mahatma Gandhi, Prithvi Datta Chandra Shobhi, Ramachandra Guha, Sans Serif, The Telegraph. Bookmark the permalink. BR Ambedkar’s aquaintance and views with the above two. Until the honesty and openness comes up from Thackeray gang, Marathis will live as middle indians neither here not there breaking glasses of some media channels hoisting RSS ideas invariably. Ambedkar was right! Not for him the condescending largesse of the upper castes. Equality is not a gift to be bestowed. It either exists or it does not.